The Mothman sightings are considered to be one of the world's greatest unsolved mysteries. This mystifying creature was seen in two specific regions of the State of West Virginia. These regions include the cities of Point Pleasant, as well as Charleston. The sightings started on the 12th day of November in the year of 1966. Individuals that witnessed this creature described characteristics such as the fact that the being was shaped much like a man and it had very distinctive wings that resembled that of a moth. The eyes of the creature apparently had reflective properties and displayed a red color that appeared to glow - even where there was no source of lighting. Many have even stated that the eyes are not located on an actual head, but imbedded in the chest area. In this guide, you will learn about the unsolved mysteries surrounding the Mothman sightings. In the year of 1966, several men were working in a cemetery near the city of Clendenin which is located in the State of West Virginia. They were simply making preparations for an upcoming burial service. While in the cemetery, they developed an odd feeling of being watched. However, there were no other individuals present. They continued working, shaking off the feeling with the notion that it was simply related to the whole cemetery enigma. A few short minutes later, they were absolutely startled to hear a sound in a tree near them. As they looked to observe the culprit of the commotion, they observed a figure that looked much like a man flying from one of the branches. This is believed to be the first Mothman sighting. Just three short days later, on the 15th day of November in 1966, a group of two couples were passing an industrial plant near the city of Point Pleasant. They witnessed the supposed Mothman. It started with identifying the eerie red glow of the eyes of the creature. They then observed that it was relatively large, reflected the same build as a man, and had extensive wings. Given the fact that the sighting frightened them, they continued traveling. Just a short time passed and they observed the mysterious creature on the side of the road on top of a small hill. Things got really intense at that point because the creature actually followed their car! Despite the fact that they were traveling as quickly as they could, it was able to maintain the same speed as the car. This occurred on the highway identified as "62". Later that day, several other people witnessed the unusual creature. Later in the evening of November 15th, a highly reputed building contractor experienced his first sighting. The man's name was Newell Partridge. He was simply enjoying a quiet evening of television when the unit began to act up. He observed interference and heard a large number of sounds. Suddenly, the set went out completely and he realized that the strange and mysterious noises were coming from outside of the home. It was then that his beloved dog, Bandit, began to bark and howl in an unusual fashion. He walked outside and faced his flashlight on the area where the dog was located. It was then that he saw the ominous red glowing eyes of the Mothman. The dog chased after the creature. While Partridge attempted to stop him, he was unsuccessful. Later reports would indicate that a dog's body had been found in the area, but Partridge was never able to locate his beloved pet. Deputy Halstead elected to hold a conference for the community and the press on November 16th. He had no doubt that the citizens of the area were telling the truth. He had known most of the people that had reported the sightings either all of his life, or all of theirs. He realized fear when he saw it, and the citizens of his community were scared. He knew that they were not making false reports. Unfortunately, the press and other types of individuals that were investigating the accounts of the Mothman sightings were not so convinced that the truth was being expressed by what the witnesses shared with them. Eventually, many individuals in the area would experience many strange and unusual events. Many reported observing what they believed to be UFOs. Many even claimed that they had experienced the popular government based investigation group called the "Men in Black". 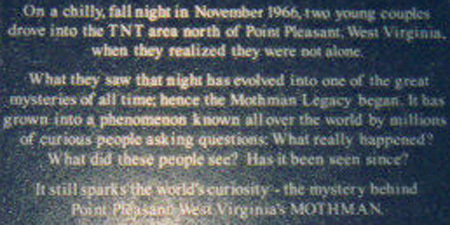 John Keel, an avid author, went to the area and documented as much as he possibly could surrounding the Mothman sightings. He was able to determine a minimum of one hundred witness accounts that took place from the year of 1966 to the following November in 1967. It is believed that the creature was as small as five feet or as large as eight feet. It is believed that the sightings were directly related to witness accounts of possible UFOs, the strange dark dressed men, as well as the electromagnetic interruptions the town experienced. In the year of 2002, the film called "The Mothman Prophecies" was released. Directed by a man of the name Mark Pellington it was a pure adaptation of the book that was published in the year of 1976 by the parapsychologist and lead investigator of the original Mothman sightings, John Keel. If you are interested in learning more about the greatest unsolved mysteries of the Mothman sightings, you may be interested in reading this book or watching this movie. You will then be able to gain a complete understanding of the mysterious events that took place in Point Pleasant from 1966 to 1967.